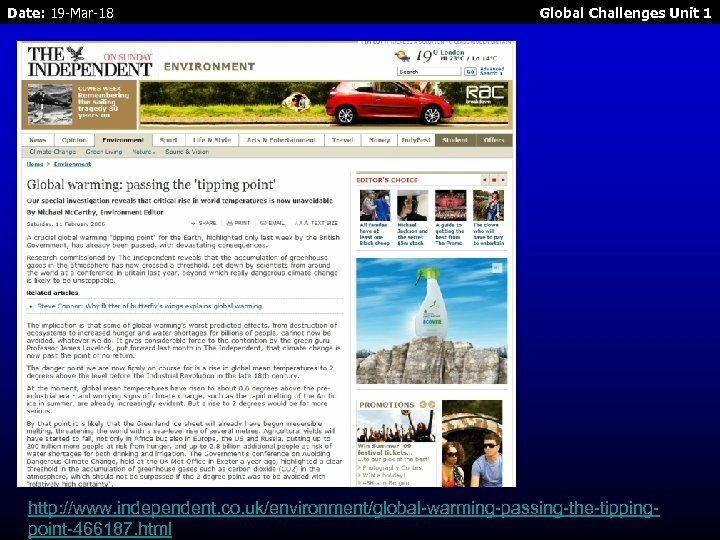 Date: 19 -Mar-18 Global Challenges Unit 1 Aim To understand why we may be at a tipping point. 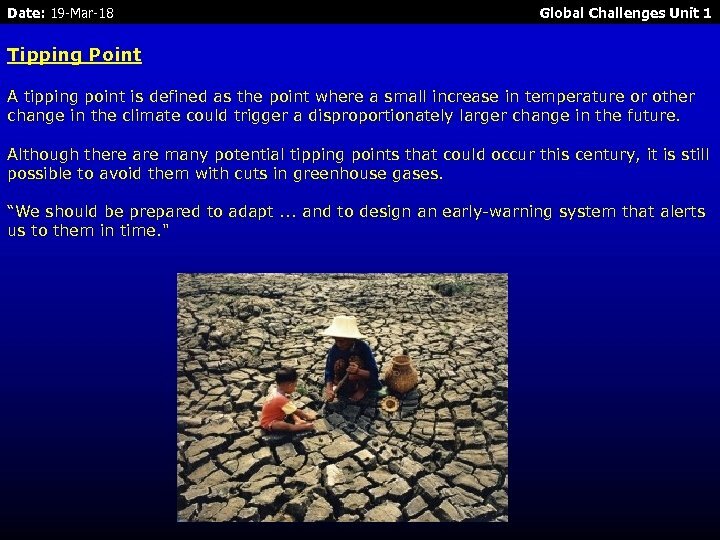 Date: 19 -Mar-18 Global Challenges Unit 1 Tipping Point A tipping point is defined as the point where a small increase in temperature or other change in the climate could trigger a disproportionately larger change in the future. 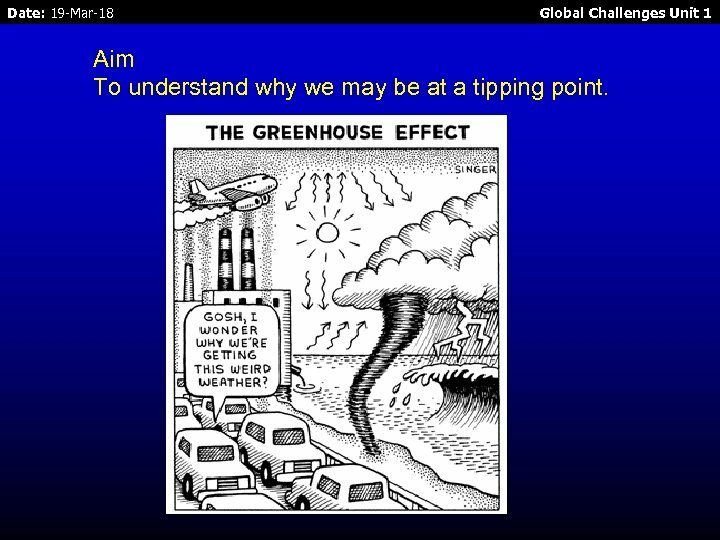 Although there are many potential tipping points that could occur this century, it is still possible to avoid them with cuts in greenhouse gases. “We should be prepared to adapt. . . and to design an early-warning system that alerts us to them in time. " 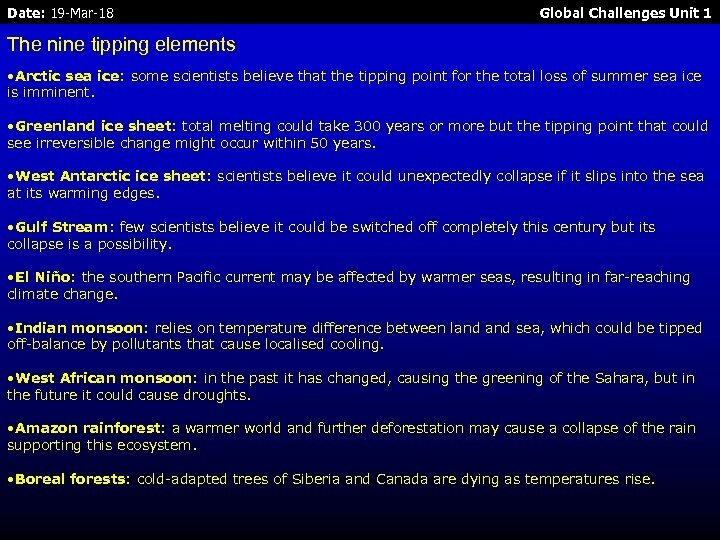 Date: 19 -Mar-18 Global Challenges Unit 1 The nine tipping elements • Arctic sea ice: some scientists believe that the tipping point for the total loss of summer sea ice is imminent. 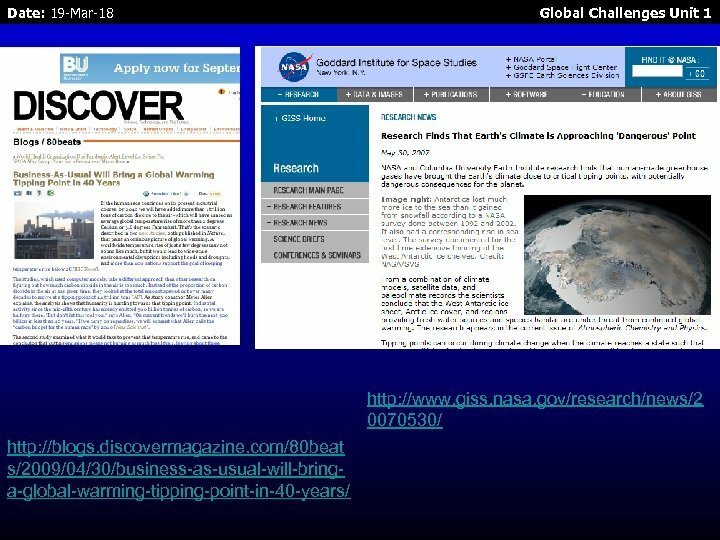 • Greenland ice sheet: total melting could take 300 years or more but the tipping point that could see irreversible change might occur within 50 years. • West Antarctic ice sheet: scientists believe it could unexpectedly collapse if it slips into the sea at its warming edges. 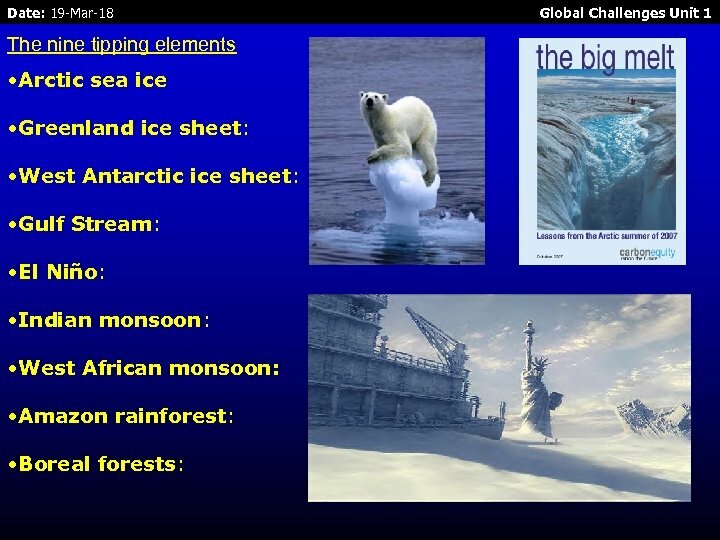 • Gulf Stream: few scientists believe it could be switched off completely this century but its collapse is a possibility. • El Niño: the southern Pacific current may be affected by warmer seas, resulting in far-reaching climate change. • Indian monsoon: relies on temperature difference between land sea, which could be tipped off-balance by pollutants that cause localised cooling. • West African monsoon: in the past it has changed, causing the greening of the Sahara, but in the future it could cause droughts. • Amazon rainforest: a warmer world and further deforestation may cause a collapse of the rain supporting this ecosystem. • Boreal forests: cold-adapted trees of Siberia and Canada are dying as temperatures rise. 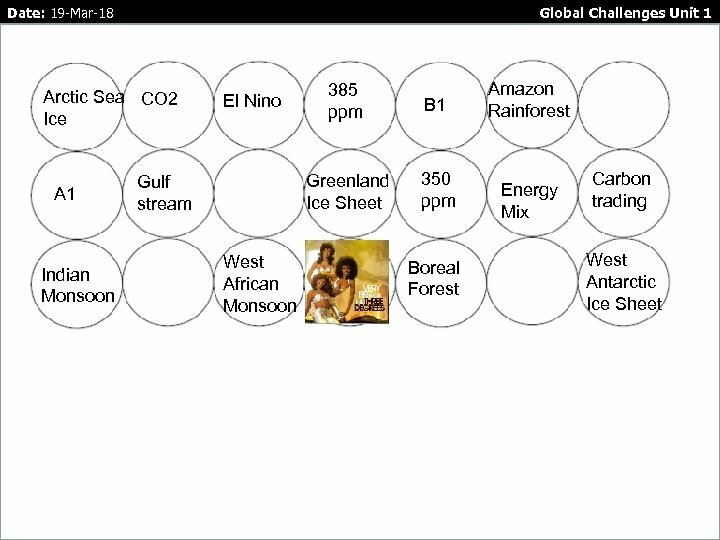 Date: 19 -Mar-18 Global Challenges Unit 1 Tipping too far? 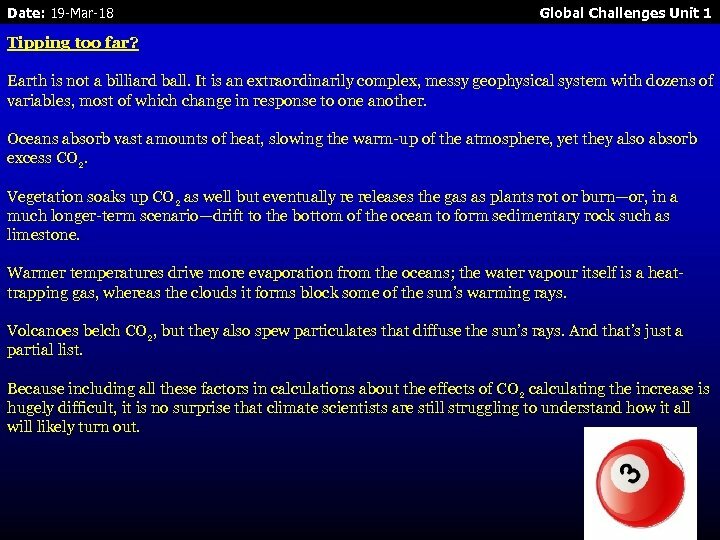 Earth is not a billiard ball. It is an extraordinarily complex, messy geophysical system with dozens of variables, most of which change in response to one another. Oceans absorb vast amounts of heat, slowing the warm-up of the atmosphere, yet they also absorb excess CO 2. Vegetation soaks up CO 2 as well but eventually re releases the gas as plants rot or burn—or, in a much longer-term scenario—drift to the bottom of the ocean to form sedimentary rock such as limestone. Warmer temperatures drive more evaporation from the oceans; the water vapour itself is a heattrapping gas, whereas the clouds it forms block some of the sun’s warming rays. Volcanoes belch CO 2, but they also spew particulates that diffuse the sun’s rays. And that’s just a partial list. Because including all these factors in calculations about the effects of CO 2 calculating the increase is hugely difficult, it is no surprise that climate scientists are still struggling to understand how it all will likely turn out. Date: 19 -Mar-18 Global Challenges Unit 1 A vast expanse of western Sibera is undergoing an unprecedented thaw that could dramatically increase the rate of global warming, climate scientists warn today. Researchers who have recently returned from the region found that an area of permafrost spanning a million square kilometres - the size of France and Germany combined - has started to melt for the first time since it formed 11, 000 years ago at the end of the last ice age. The area, which covers the entire sub-Arctic region of western Siberia, is the world's largest frozen peat bog and scientists fear that as it thaws, it will release billions of tonnes of methane, a greenhouse gas 20 times more potent than carbon dioxide, into the atmosphere. 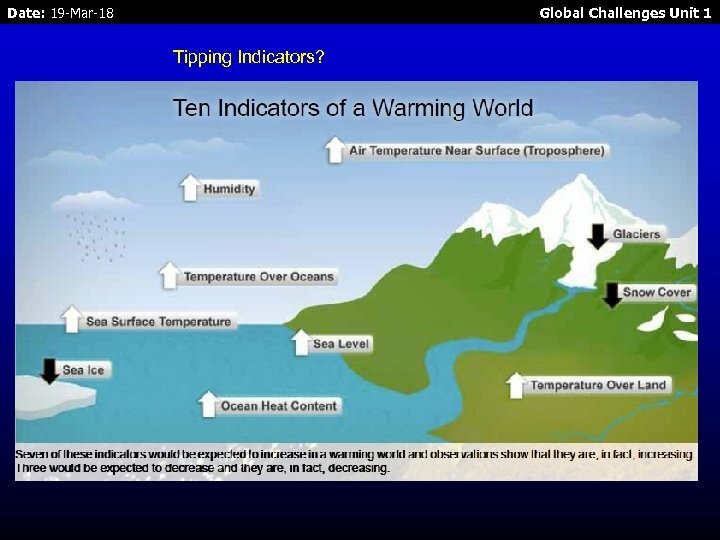 It is a scenario climate scientists have feared since first identifying "tipping points" - delicate thresholds where a slight rise in the Earth's temperature can cause a dramatic change in the environment that itself triggers a far greater increase in global temperatures. "When you start messing around with these natural systems, you can end up in situations where it's unstoppable. There are no brakes you can apply, " said David Viner, a senior scientist at the Climatic Research Unit at the University of East Anglia. "This is a big deal because you can't put the permafrost back once it's gone. The causal effect is human activity and it will ramp up temperatures even more than our emissions are doing. " The permafrost is likely to take many decades at least to thaw, so the methane locked within it will not be released into the atmosphere in one burst, said Stephen Sitch, a climate scientist at the Met Office's Hadley Centre in Exeter. But calculations by Dr Sitch and his colleagues show that even if methane seeped from the permafrost over the next 100 years, it would add around 700 m tonnes of carbon into the atmosphere each year, roughly the same amount that is released annually from the world's wetlands and agriculture. 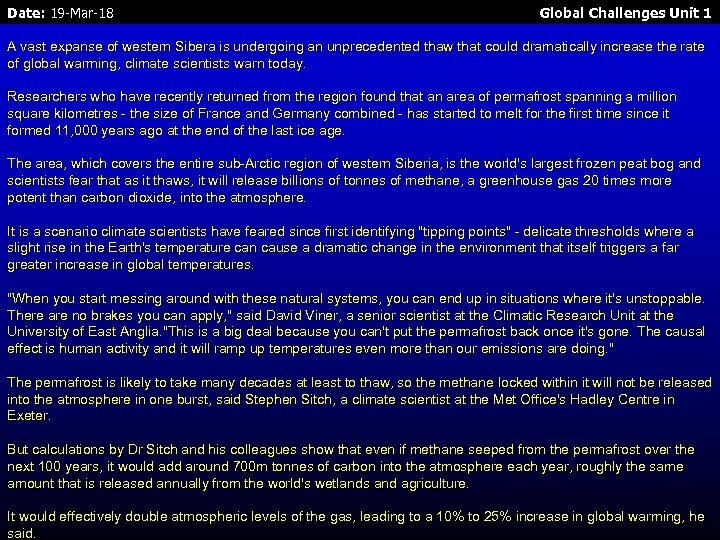 It would effectively double atmospheric levels of the gas, leading to a 10% to 25% increase in global warming, he said. 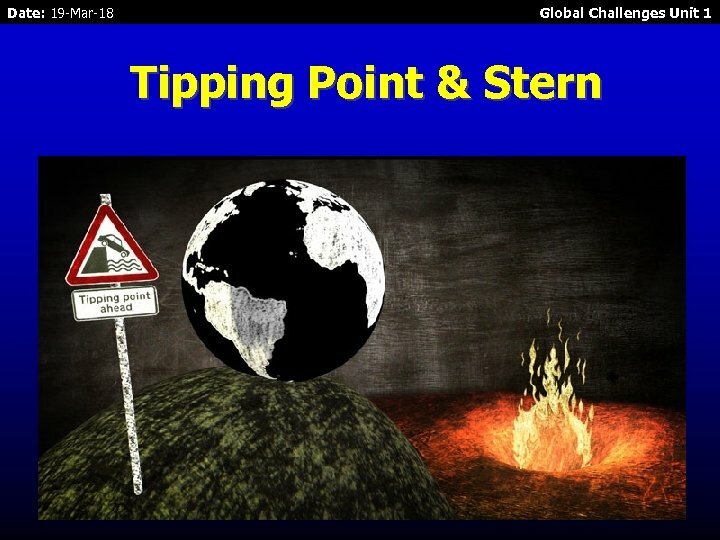 Date: 19 -Mar-18 Global Challenges Unit 1 Tipping Indicators? 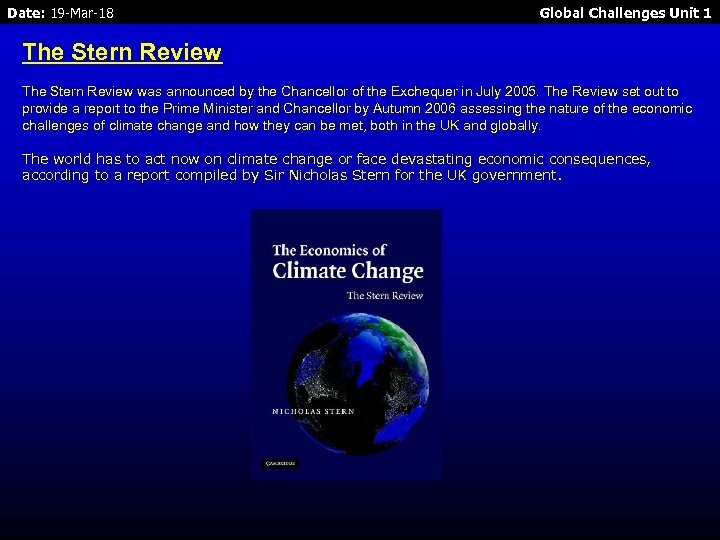 Date: 19 -Mar-18 Global Challenges Unit 1 The Stern Review was announced by the Chancellor of the Exchequer in July 2005. The Review set out to provide a report to the Prime Minister and Chancellor by Autumn 2006 assessing the nature of the economic challenges of climate change and how they can be met, both in the UK and globally. The world has to act now on climate change or face devastating economic consequences, according to a report compiled by Sir Nicholas Stern for the UK government. 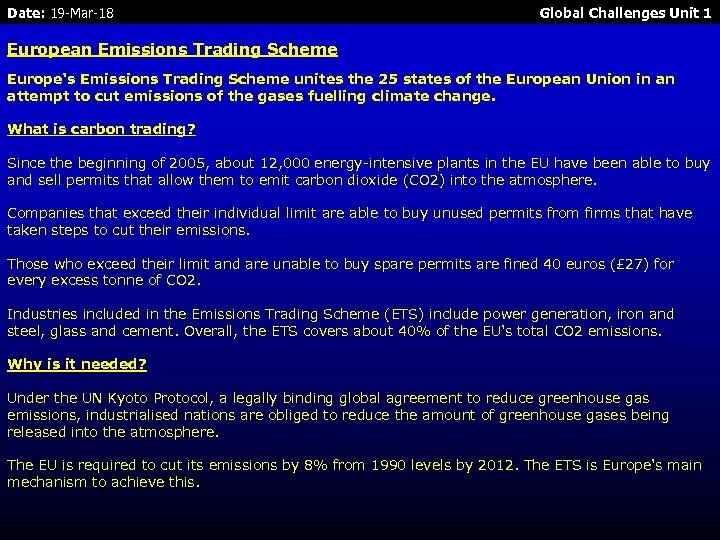 Date: 19 -Mar-18 Global Challenges Unit 1 European Emissions Trading Scheme Europe's Emissions Trading Scheme unites the 25 states of the European Union in an attempt to cut emissions of the gases fuelling climate change. What is carbon trading? Since the beginning of 2005, about 12, 000 energy-intensive plants in the EU have been able to buy and sell permits that allow them to emit carbon dioxide (CO 2) into the atmosphere. Companies that exceed their individual limit are able to buy unused permits from firms that have taken steps to cut their emissions. Those who exceed their limit and are unable to buy spare permits are fined 40 euros (£ 27) for every excess tonne of CO 2. Industries included in the Emissions Trading Scheme (ETS) include power generation, iron and steel, glass and cement. Overall, the ETS covers about 40% of the EU's total CO 2 emissions. Why is it needed? Under the UN Kyoto Protocol, a legally binding global agreement to reduce greenhouse gas emissions, industrialised nations are obliged to reduce the amount of greenhouse gases being released into the atmosphere. The EU is required to cut its emissions by 8% from 1990 levels by 2012. The ETS is Europe's main mechanism to achieve this.